Angel Star Trails - aat picture, by Angel Lopez-Sanchez, 2014. An ingenious new $13 million instrument launched by Industry Minister Ian Macfarlane at the Australian Astronomical Observatory (AAO) at Coonabarabran will enable astronomers to explore the origins of the Milky Way. The instrument, known as ‘HERMES’, can capture and analyse light from up to 400 stars or galaxies at the same time. “Australia is a world leader in astronomy. This new instrument will allow some of our greatest scientists to make new breakthroughs in this important field,” Minister Macfarlane said. “The AAO’s Anglo-Australian Telescope is world-renowned for its record of discovery and this new instrument, HERMES, will ensure it continues to lead the way. “Using HERMES, astronomers will be able to analyse light from more than a million stars in our galaxy, helping them map the age and movements of the stars and unravel how the Milky Way formed. Mr Macfarlane said the AAO had a proud record of inventing and building world-leading technology and instruments for optical astronomers, with robotic control systems and other sensors being constructed at its laboratories for major observatories in Hawaii and Chile. “Our participation in world-class research like this, and the international collaboration on the Square Kilometre Array radio telescope, has enormous potential to build skills across many fields of technology that will create opportunities for Australian industry, including in the emerging areas of big data and high performance computing,” Mr Macfarlane said. The Australian Government contributed almost $8 million from the National Collaborative Research Infrastructure Strategy and the Education Investment Fund to the development of HERMES (the High Efficiency and Resolution Multi-Element Spectrograph). The project has been funded through Astronomy Australia Ltd, which coordinates national research infrastructure investments for the astronomy community. Light is fed into HERMES along optical fibres, which are positioned in the telescope by world-leading robotic technology developed by the AAO. HERMES then spreads out the colours of the light into spectra that tell us about the motion and chemical composition of the stars in our Milky Way, through a new project known as the ‘Galactic Archaeology with HERMES', or GALAH, survey. The GALAH survey is a multinational project involving 70 astronomers from 17 institutions in eight countries, led by Professor Ken Freeman from the Australian National University, Professor Joss Bland-Hawthorn from the University of Sydney and Dr Gayandhi De Silva from the AAO. “Australia has a rich heritage of research and innovation in science,” Mr Macfarlane said. “The Australian Government recognises the important role science plays in our community. This landmark astronomical survey is a prime example of the world-leading collaborations made possible by Australian science and innovation." • The High Efficiency and Resolution Multi-Element Spectrograph (HERMES) is a scientific instrument for optical astronomy research, developed and installed by the Australian Astronomical Observatory (AAO) over the last five years, at a cost of $12.78 million. • The AAO is a division of the Department of Industry. • Australian Government funding of $7.86 million—over 60% of the total cost— from the National Collaborative Research Infrastructure Strategy (NCRIS) and the Super Science Initiative supported the development and commissioning of HERMES. • The NCRIS and Super Science funding was delivered through projects managed by Astronomy Australia Ltd. NCRIS and the Super Science Initiative are administered by the Department of Education. • HERMES is a unique, world-class instrument, able to make high-quality observations of about 400 stars, in four different wavelength ranges of light, in a single exposure. • HERMES is attached to the Anglo-Australian Telescope, and supplies the data to enable ‘galactic archaeology’, a method by which astronomers piece together the history of how our Milky Way galaxy came together over billions of years. 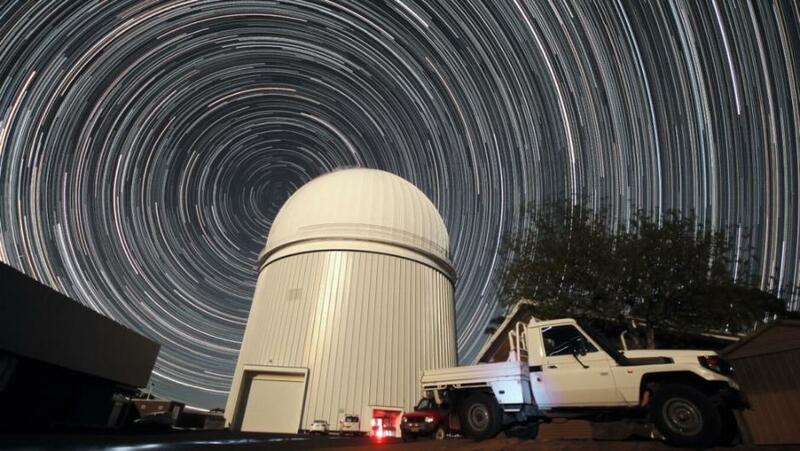 • At the focal plane of the Anglo-Australian Telescope, an advanced and precise robotic system positions hundreds of individual optical fibres to catch the light from nearly 400 individual astronomical objects—including stars or galaxies. The light from the hundreds of objects is fed simultaneously along the optical fibres into the HERMES instrument. • The robotic system can rapidly reposition these optical fibres to a pattern that exactly matches a known arrangement of stars or galaxies that the astronomers choose to analyse. • HERMES then splits the light signals from these hundreds of optical fibres into four windows, each measuring a different part of the light spectrum, from infrared to blue, with very high resolution. • By repeating the process many times, the Galactic Archaeology with HERMES (GALAH) Survey will analyse the properties of the light in each of these windows from over a million stars in our galaxy. • HERMES will also be able to measure the radial velocities (speeds) of the one million individual stars. These speeds will be combined with measurements of the stars’ positions made by GAIA, a spacecraft of the European Space Agency, to learn where stars have travelled in their lifetimes. • From this massive set of data, researchers will be able to determine factors such as the motion and chemical composition of the million stars. the formation of the Milky Way. • The GALAH project is led by Professor Ken Freeman (ANU), Professor Joss Bland-Hawthorn (University of Sydney) and Dr Gayandhi De Silva (AAO). The project team has 70 members, from 17 institutions in 8 countries. • The AAT is an optical telescope in the 4-metre class, located at the Siding Spring Observatory 27 kilometres west of Coonabarabran. It is one of two telescopes operated by the Australian Astronomical Observatory: the other is the UK Schmidt Telescope, also located at the Siding Spring Observatory. • The AAT was commissioned in 1974, and has a primary mirror with a diameter of 3.89M. 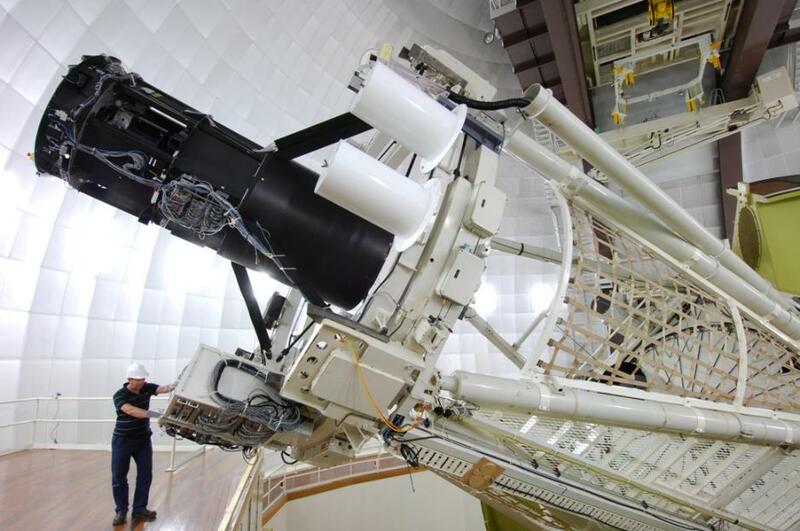 The AAT possesses excellent optics, exceptional mechanical stability and precision control which have ensured its high value to researchers as a globally significant telescope. * showing that ‘dark energy’ is real; and o measuring how much ‘normal’ matter, ‘dark’ matter and ‘dark energy’ the universe contains. Professor Ken Freeman, Duffield Professor of Astronomy in the Research School of Astronomy and Astrophysics at Mount Stromlo Observatory, ANU. - Project Astronomer for the HERMES instrument. Dr Gayandhi De Silva, AAO. - Project Scientist for the HERMES instrument. Dr Sarah Martell, University of NSW and AAO Fellow. - Project Manager for the GALAH project.